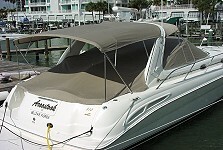 Welcome to All Marine Canvas, Inc.
Bimini tops, sunshades and fly curtains for shade. Isinglass front and side windscreens and camper packages for comfort. Bridge enclosures for protection from inclement weather. Full mooring or storage covers, blackout or mask curtains, snap on cockpit and bow covers, or aft curtains for storage. All our covers are REINFORCED at wear and stress points, such as window frames, cleats, bow points, rear corners, trim tabs and motors. Covers custom made for, but not limited to; Consoles, Helms, Instruments, Electronics, Seats, Cabin windows, Fly bridge, Windlass, Winches, Sails, Hatches, BBQ Grills, Bumpers, and Tables. We also recover T-tops and make Life Jacket storage holders. REPAIRS, of course we do REPAIRS! Big or small, from a complete resew of biminis or bridge enclosures to the smallest stitching problem. Either walk the repair into our shop where you might (with an appointment) be able to wait moments and take the repair with you. Schedule for DOCKSIDE service. If your vessel is water bound in Pinellas County or the immediate Tampa Bay area, we offer dockside services ranging from small repairs to a complete BETTER than factory canvas replacements. Our service area includes: Tierra Verde, St. Petersburg, Largo, Seminole, Clearwater, Safety Harbor, Dunedin, Palm Harbor, Ozona, Oldsmar, Western Hillsborough, Crystal Beach,Tarpon Springs and Pinellas County Beaches. Call for your free estimate. All Marine Canvas, Inc is your Tampa Bay Canvas Repair business. Whether you have a small stitching repair or a large repair, stop by All Marine Canvas, Inc and we’ll take care of it for you. Give us a call for an appointment, and bring in your repair to our shop and we’ll fix it while you wait! We include a free estimate on your Boat Canvas Tampa Bay project. Our experts will work with you to plan your project and offer advice against any design flaws. We offer a product warrantee that is outlined in the warrantee page of the website. 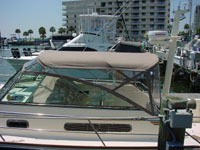 All Marine Canvas will offer advice and instruction for how to care for your custom canvas boat top in Pinellas County. We know how important your boat is to you, and protecting it is our number one priority. All of our Tampa Bay boat tops are reinforced at stress points to protect against wear and tear. Our covers can be made for anything from electronics to consoles to seats. We also create life jacket storage containers, bbq grill covers, table canvases and storage covers in Pinellas. Almost anything on your boat that needs a canvas, the Custom Boat Tops Tampa Bay Experts will design and create it for you. We also recover T- tops in Tampa Bay. 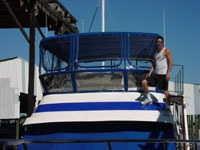 All Marine Canvas, Inc offers dockside services in Pinellas County. If you’re in the Tampa Bay area and are need of a small or large repair or replacement, give us a call for your free estimate. The convenience of Dock Side Pinellas Service will get your repairs done while your vessel is water bound. Thank you for visiting our website. Please explore our Gallery to view more of our work. Here is a guide to proper canvas top replacement parts names.